﻿ Pet Portraits for Your Holiday Cards and Gifts! 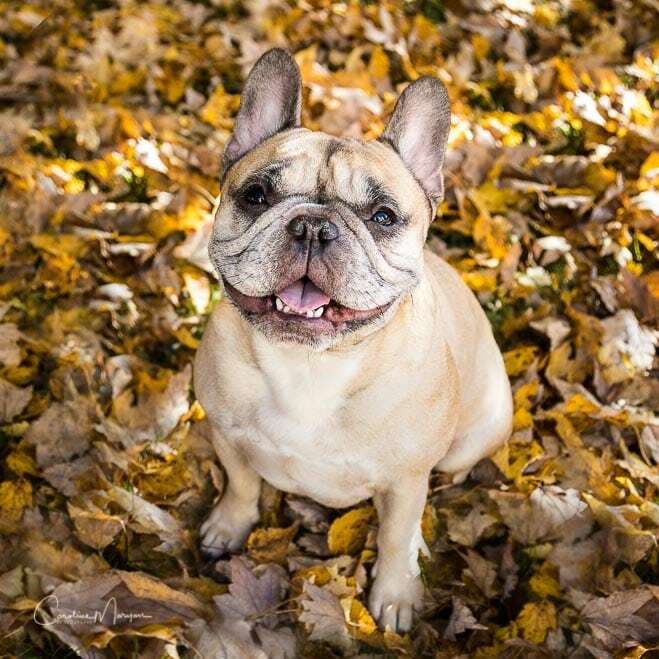 Let’s start with the settings for the first photo, an autumn shot of Napoleon, who is a French Bulldog. This was shot in aperture mode, ISO 100, f/4.0 and 1/100 sec, at 35 mm. What makes this a portrait is the shallow depth of field. Napoleon is the same color as the leaves, so he would blend in if this were shot at f/8. I’ve also used only one focus point, and placed it on his eye. Since both eyes are the same distance from the camera, it doesn’t matter which one I chose. If you look carefully, you’ll see that only his face is in focus. His feet are not. For this photo, I shot from above. Now, we have the settings, but here is the challenge. 1/100 second is slow for an animal shot, so you have to get your dog to sit very still and really focus on you. It helps to have an assistant, with some treats and squeaky toys. In this case, my husband, Skip, stood behind me and squeezed the toy as close to my camera as possible. If you don’t have an assistant, a kazoo might work. Our dogs are pretty jaded. I can sing and make funny noises all I want, but they aren’t impressed. However, the word, “TREAT” sometimes brings the correct expression. Dog portraits can be time consuming, so bring a healthy dose of patience and love, along with a good sense of humor, with you! Another reason that this photo works is that there are no harsh shadows. The photo was taken at about 12:30 pm, but I sat Napoleon in the shade. Since it was taken in late November, the sun was low in the sky, even around noon, so the leaves had some dappled sunlight brightening them up. The ambient light was bright, so the shutter speed was quick enough for a sharp photo, as long as he stayed still. If I’d waited until late in the afternoon for the golden hour, it wouldn’t have worked as well. There wouldn’t have been enough light to allow for a fast enough shutter speed. 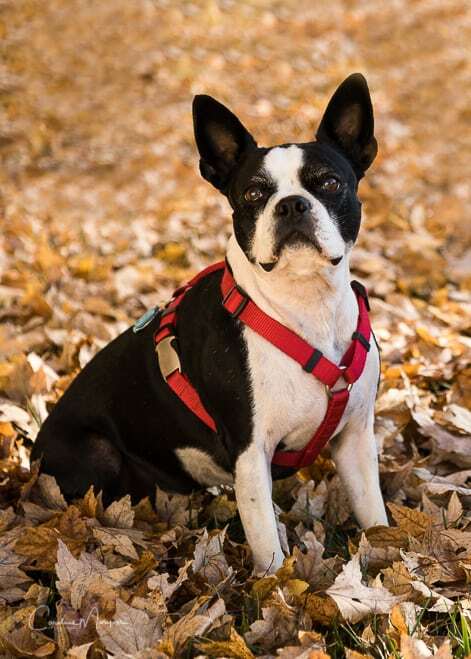 A portrait of Kenzie, the Boston Terrier, in the autumn leaves. Click on the photo to see a larger version. The next photo is an example of shooting at the level of the dog. It’s a shot of our Boston Terrier, Kenzie. She is sitting on a hillside, so the fallen leaves continue their out-of-focus pattern behind her. The shallow depth of field helps to define her. This was shot in aperture mode, ISO 100, F/4.0 and 1/200 second, at 85 mm. Again, I focused on her eye. It was shot at about 11 am, in the shade. 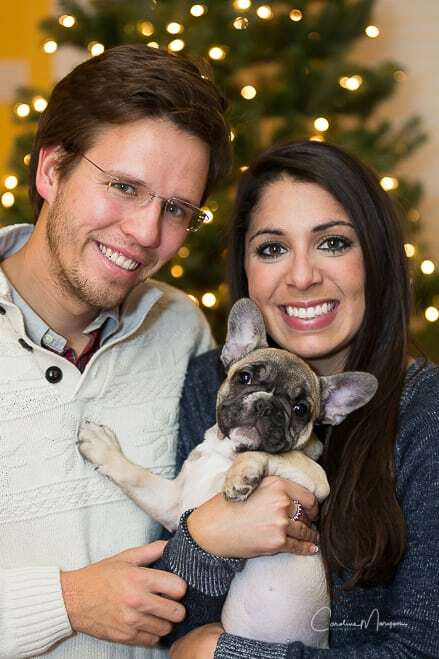 Napoleon, the French Bulldog, poses with his family at Christmas time. Click on the photo to see a larger version. There’s still plenty of time before the holidays to get the shot! I hope these tips will help inspire you to give it a try. These also make great gifts, either framed or on a coffee mug, or even as a puzzle. What dog owner wouldn’t love that?